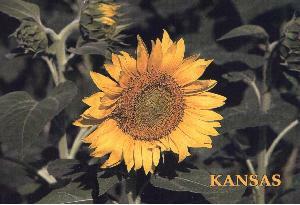 On this page can be seen the latest CCD pictures taken from Sunflower Observatory, here in Olathe, Kansas. These are usually guided exposures of decent enough quality to share. I hope you enjoy looking at them as much I did taking them. This is a combination of 17 five minute guided exposure taken on March 31 with the ST7 on the 10" LX200. Total exposure time one hour and 25 minutes. It is interesting how much detail shows up. 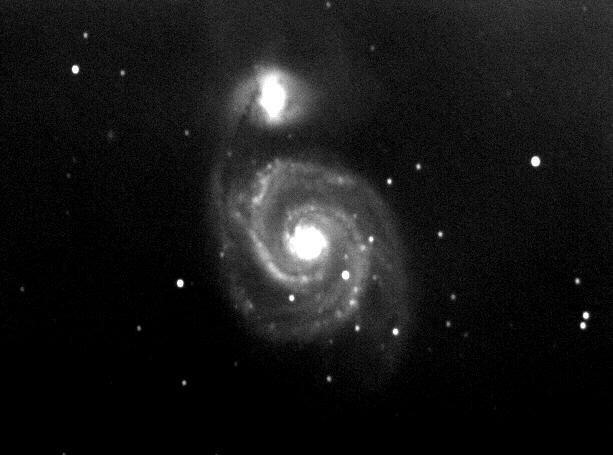 This is a combination of 6 five minute guided exposure taken on March 25, 1999 with the ST7 on the 10" LX200. Total exposure time 30 minutes. The image was then made false color in red. E. Halderson, T. Shefler, M. Modjaz, J. Y. 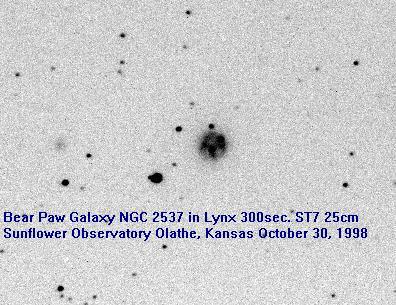 King, W. D. Li, R. R. Treffers, and A. V. Filippenko, University of California at Berkeley, reported their discovery of an apparent nova during the course of the Lick Observatory Supernova Search (cf. 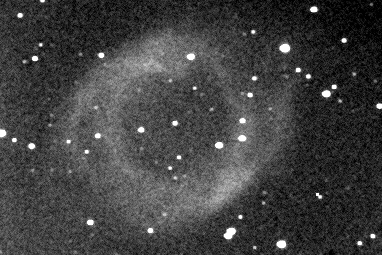 IAUC 6627) with the 0.8-m Katzman Automatic Imaging Telescope (KAIT). The nova was found and confirmed on unfiltered images taken on Aug. 31.4 (mag about 16.6) and Sept. 1.3 UT (mag about 16.5). The object is located at R.A. = 0h42m39s.29, Decl. = +40o51'10".3 (equinox 2000.0), which is about 28".5 west and 44".7 south of the nucleus of NGC 221 (the satellite galaxy of M31). A KAIT image obtained on Aug. 27.3 UT did not show a star at the position of the nova (limiting mag about 19.0). 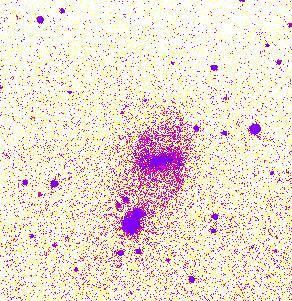 S. Benetti, Telescopio Nazionale Galileo, La Palma; and T. Pursimo and P. Heinamaki, Tuorla Observatory, confirm the presence of a new object of magnitude R = 15.87 +/- 0.03 located 28".5 west and 45".1 south of the nucleus of NGC 221, on an R frame taken with the Nordic Optical Telescope at La Palma on Sept. 1.12 UT. 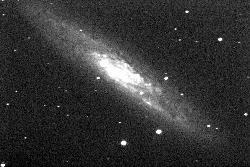 Speaking of nova, the supernova that occurred in M96 in May was one of the most spectacular in years. I had even imaged it without realizing it a few days before its discovery. 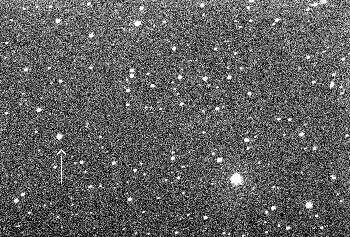 Here is a discovery image. I observed this one for many weeks until it went behind the sun. Then on October 30 early in the morning I took this image. The supernova has dimmed alot, but it has not completely disappeared. This galaxy looks like a bear's paw. Hence, it's name. It is some type of peculiar interacting barred spiral. There is a faint companion to the east a bit. What could cause this peculiar shape? 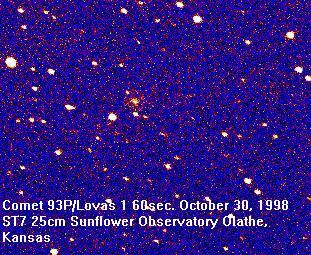 Periodic comet 93P/ Lovas 1 is a recurring comet that I imaged on October 30, 1998. 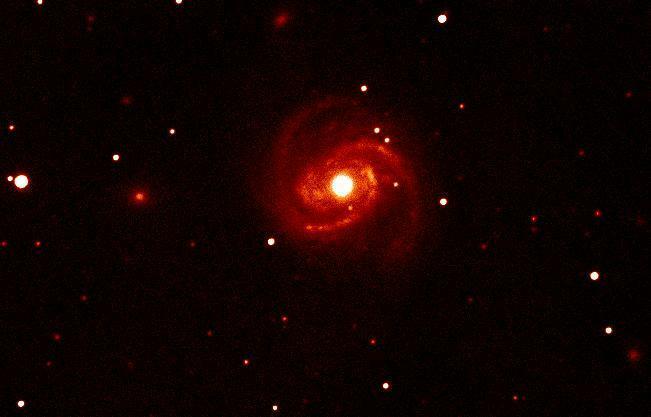 This is a barred spiral galaxy located in the NE corner of the great square of Pegasus. NGC 7741 is about 32 Million light years away and a great example of a SBc barred spiral easily visible in amateur telescopes. This image was taken September 9, 1998 and is a five minute exposure, which has been rendered in false color to bring out the detail of the faint arms at the end of the bar. The Helix Nebula is a nice planetary nebula in Aquarius. This is a 600 second guided exposure, enough to start seeing some detail. 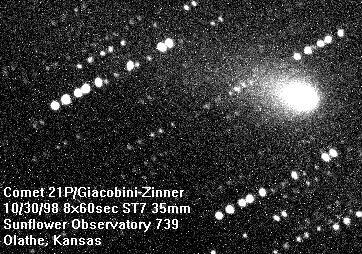 These two pictures show the asteroid 980 Anacosta as it cruises across the stars. These pictures were taken about twenty four hours apart. The images are 60 second unguided exposures. After Andromeda (M31) this galaxy is the largest apparent sized galaxy visible to northern hemisphere observers. It is truly awesome. For a full sized view go to Full sized NGC253 This is a 600 second guided exposure. Uranus has 15 known satellites. Of these only five are even remotely observable from backyard telescopes according to Fred W. Price in his book, The Planet Observer�s Handbook. According to Price, Titania and Oberon should be visible from a dark site using an 8-inch telescope. Ariel should be visible with a 12-14 inch and Umbriel requires at least 16 inches. 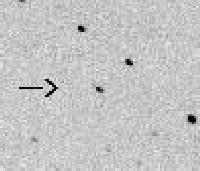 The other satellites of Uranus, such as Miranda are only visible in professional observatory telescopes. According to Price it might be worthwhile investigating which of the two outer satellites appears to be brighter. Different values at different times may be due to the changing positional relationship of Uranus and its satellites. The satellites may be compared to one another for studies of relative brightness or with nearby comparison stars. The glare of the disc of Uranus can be a nuisance in making these estimates. Price recommends making estimates when the satellites are an equal distance from the planet. 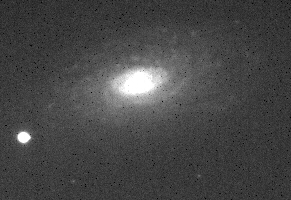 Here are some CCD images of Uranus taken 06:00:39 UT on July 19, 1998 at the Sunflower Observatory using the ST7 on 25cm LX200 at -4.40C, 10 second exposure. Above is a full frame view in negative and below is a labeled enlargement showing four satellites. Comparison to the Real Sky POSS plates showed no known stars at these positions. Which moons are these? What are the two outer moons? Which is brighter? Neptune is encircled by eight satellites and a system of rings. 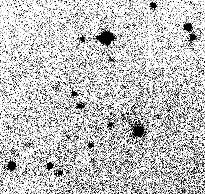 All are invisible from Earth based amateur telescopes except for Triton. Triton is 1690 miles in diameter and about 219,300 from Neptune with a rotational period of 5.877 days. 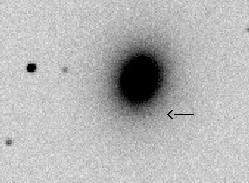 At 13.5 magnitude, Triton can be observed and imaged by amateurs. It�s greatest angular distance from the planet is 17 arc seconds. Triton is the most massive satellite in the solar system. It is unusual in having a retrograde motion like an asteroid but it is much too large to be a captured asteroid. The orbit may be unstable and it is possible that some catastrophe at some remote epoch in the Solar System�s history may have been responsible for this. Pluto may have been a satellite of Neptune at some time in the past. This image of Neptune and Triton was taken at 6:12UT on June 26, 1998 and is a 60 sec. Exposure at -4C. Triton is very close to Neptune. Here is a CCD image of Pluto taken the evening of July 19, 1998. This is a 60 second exposure and Pluto is indistinquishable from the stars surrounding it. The use of the Real Sky image for that section of sky made it possible to positively identify the planet. Pluto has an estimated diameter of 1431 miles and an apparent magnitude of 13.7. Pluto's satellite Charon rotates Pluto at a distance of 12204 miles and is nly 739 miles in diameter. 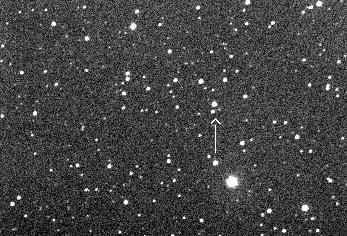 Charon has an apparent magnitude of 16.8, and probably is not within the range of this CCD image. Can you see it in the enlarged image below? The small blur up and to the left is a 16th magnitude star. What about down and to the right? Is that Charon or just a little drift in the image? What do you think? 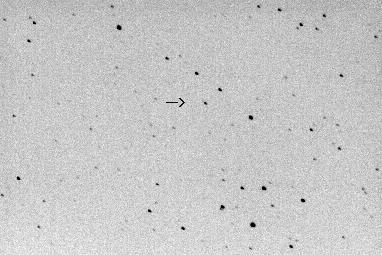 Here is my first image of Comet 21P. I have been imaging this comet since it was in Hercules when it was very faint. It has continued to brighten as can be seen in this image: Oct. 30 image This comet has moved all the way over into Aquila near the border with Scutum. It's current coordinates can be found at the Comet page in the links listed below. On October 8, 1998 there was supposed to be a meteor storm right after dark due to the earth passing through the debris left by this comet. That was my 50th birthday. What a present, huh? Well, it fizzled. Observers in eastern Europe caught a slight peak in activity for about a half an hour while it was still light here, but it was over completely by the time it got dark in the USA. Comet Observation Page: Good place to look at latest information on comets.